I am always interested to see Tupperware's regional variations. When I deliver Lena's order this week, she shows me her Lebanese Tupperware olive keeper. It is a sort of reverse-cafetiere, with a plunger that lifts the olives out of the brine that they are stored in. There is also a little pair of tongs built in, with which to select your olive once you have raised the plunger. I know there is a similar product in New Zealand for storing the pickled beetroot so beloved in that country, because Kiwi Londoners have asked me if I can get one for them (I can't). Anyway, Lena says she is moving this summer and wants to convene some of her expat Lebanese friends for a Tupperware party when she does. Meanwhile she is feeding her habit with occasional one-off orders. The Heavens open moments after I step off the bus on my way to Glenn's Tupperware BBQ in North London. I have to shelter under a tree round the corner from his house, a river of rainwater coursing down the road towards Chalk Farm station. The rain became torrential and I practically climb inside someone's privet in my effort to keep myself and the kitbag dry. The Cool Cubes is the big hit of the party. 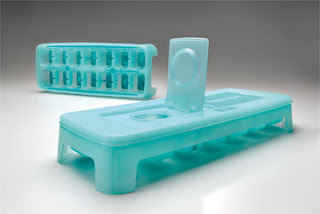 Glenn and his friends buy six of Tupperware's design-award winning ice tray, which you can read about here. What's more, when I get home there is a plaintive email from Paul, a design-conscious New Yorker, who asks if I can send him some Cool Cubes by Air Mail, since it is "only available is Europe. This is just not right." The Tupperware Politburo forbids me from selling outside the UK and from fielding enquiries by email -- yawn -- but the deal-breaker is really the exchange rate: the weak dollar and strong pound will make the Cool Cubes a deeply unCool $20 apiece. Last summer I left my kitbag behind on a bus luggage rack in my post-party exhaustion. I do still sometimes put it in the rack, as you can see, but I now keep a beady eye on it at all times. I can just imagine my whole demonstration kit being detonated as a suspicious package. A nice email arrives this week from Jonathan Guthrie at the Financial Times, who has that noticed my "entertaining website" has gone offline. He says he is sorry to see it go. Not as sorry as I am. I have not been able to generate any new customers without my website, and only have one more party scheduled -- at the Royal Netherlands Embassy if you please. Then that's it. Tupperware and I will be on a break.